Little Zombies: The Last Holiday Concert: Are you sick of this yet? 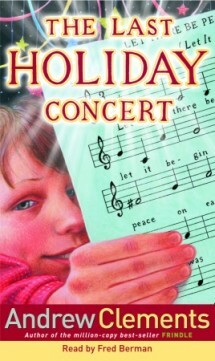 The Last Holiday Concert: Are you sick of this yet? Rating: Yep, another one to add to the list. Great for a holiday read! For Hart Evans, being the most popular fifth grader has its advantages: kids look up to him and teachers let him get away with everything. But during one choir practice, Hart zones out too far, accidentally flinging a rubber band at his teacher. Mr. Meinert realizes that if Hart is ever going to discover his musical potential, his punishment must march to a different drummer. And then, as Mr. Meinert is about to leave school because there is no funding left for his job, he orchestrates a class vote to appoint Hart as the new interim choir director. Now it's Hart's job to ready the class for the annual Holiday concert, and ultimately to convince the board why his teacher should stay in school. Review: Once again a typical Andrew Clements book. He knows what it's all about. Kids are smart and if you give them the chance, they can do great things! And the ending was good. Bittersweet. If your child is enjoying Andrew Clements' books, this is another great one. I've tried two others of his that I actually didn't enjoy that much. I couldn't really get into Extra Credit that much. I also didn't like Troublemaker. I tried a few pages from that one, but seeing as I don't use bad language, that book sort of kind of used an inappropriate word. Or rather an appropriate word in an inappropriate way. And I wasn't feeling too good about that one. So disclaimer for that one! And if you think I'm reviewing an old book, just wait til the next review! 1998. Which proves that not only newer books are good! You can buy it from Amazon here ! Infinity and Me: What does infinity mean to you?